President Donald Trump said National Football League (NFL) owners are hesitant to stop their players from kneeling in protest over racial inequality during the national anthem because “they’re afraid of their players.” Seventy percent of NFL players are African-Americans. “I have so many friends that are owners. And they’re in a box. I mean, I’ve spoken to a couple of them. They say, ‘we are in a situation where we have to do something,’” Trump told the ‘Fox and Friends’ program aired on Thursday. Trump told Fox the league has a wide range of rules, suggesting it should apply new rules to those who protest the anthem by kneeling. “They have rules for everything - you can’t dance in the end zone, you can’t wear pink socks relative to breast cancer - they have rules for everything,” the president told Fox. “Why aren’t they honoring this country by enforcing a rule that’s been in existence for a long time." Fox asked Trump if the feud wasn’t a distraction to his administration’s accomplishments. “It’s not a distraction at all because I’m doing a lot. We’ve passed over 50 pieces of legislation, we have a Supreme Court judge, a much stronger military, much stronger borders now, we’re going to get the wall,” Trump said. A petition with nearly 50,000 signatures seeks the removal of a statue of retired Baltimore Ravens star Ray Lewis, after he joined NFL players kneeling during the national anthem, according to WABC. The petition on change.org says the anthem honors the United States and its veterans. It reads: "To kneel during it is disrespectful, regardless of what you are protesting." “I feel that Ray Lewis has been singled out unfairly by a small group of unpatriotic fans who are using the cloak of patriotism to find way to intimidate those who would peacefully protest against their political party of choice,” wrote Edward Wilson in his petition. Wilson argued that Lewis is one of the greatest NFL players of all time who played in three different decades and led the Ravens to two Super Bowl victories. 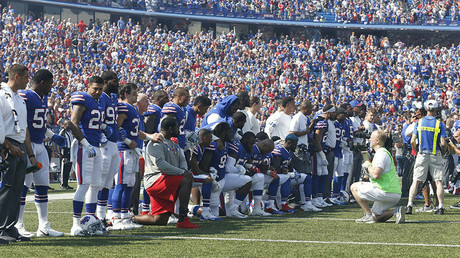 There are dozens of petitions for and against the NFL for a variety of reasons on change.org, a website where people can start campaigns and mobilize supporters. 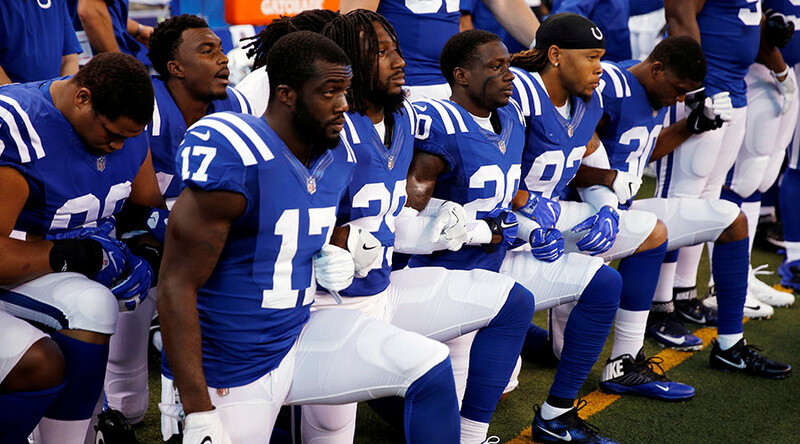 One petition for a boycott of the NFL, and has so far garnered 3,000 signatures.